42 February/March 2018 unmanned systems inside A successful Washington compromise is often described as a deal where every- one gets something but no one is entirely happy. The recently released recom- mendations on remote drone identification and tracking reads less like the usual compromise and more like a temporary ceasefire. 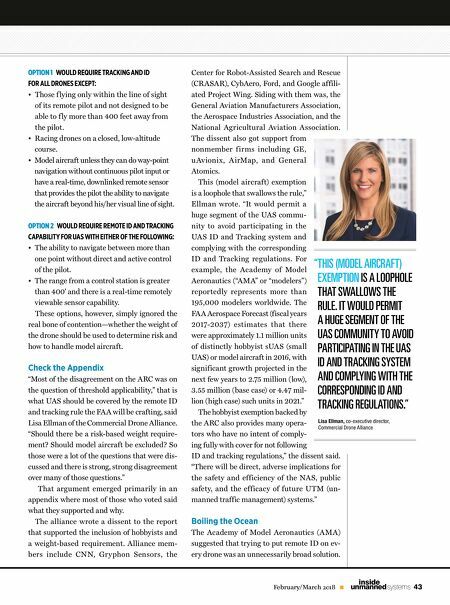 As a result, the Federal Aviation Administration (FAA) will not have a foundation of agreement on which to build its proposed new rule, making the pace of drone integration even more unsure. The Aviation Rule Committee (ARC) on UAS Identification and Tracking (UAS ID) was formed in June 2017 after plans to issue rules allowing drone f lights over people were frozen, suddenly, early that year. The regula- tory plan had stalled after both law enforce- ment and homeland security agencies ex- pressed concerns about allowing such f lights because they had no way to identify bad actors. It's easy to enforce limitations when no one is permitted to make such f lights. When f lights over people become common place, how do you sort out who is f lying illegally and may be dangerous? 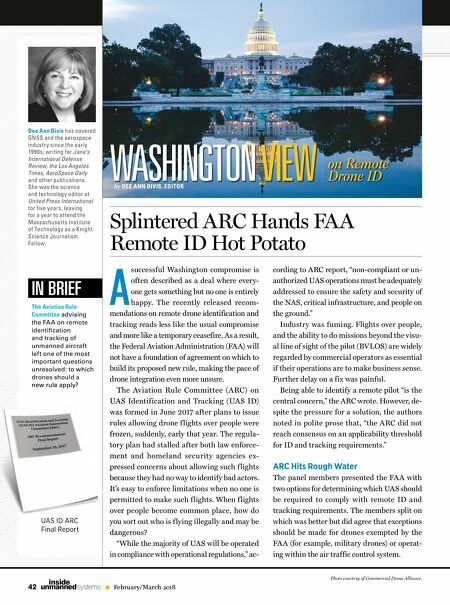 "While the majority of UAS will be operated in compliance with operational regulations," ac- Splintered ARC Hands FAA Remote ID Hot Potato WASHINGTON VIEW by DEE ANN DIVIS, EDITOR Dee Ann Divis has covered GNSS and the aerospace industry since the early 1990s, writing for Jane's International Defense Review, the Los Angeles Times, AeroSpace Daily and other publications. She was the science and technology editor at United Press International for five years, leaving for a year to at tend the Massachuset ts Institute of Technology as a Knight Science Journalism Fellow. IN BRIEF The Aviation Rule Committee advising the FAA on remote identifi cation and tracking of unmanned aircraft left one of the most important questions unresolved: to which drones should a new rule apply? cording to ARC report, "non-compliant or un- authorized UAS operations must be adequately addressed to ensure the safety and security of the NAS, critical infrastructure, and people on the ground." Industry was fuming. Flights over people, and the ability to do missions beyond the visu- al line of sight of the pilot (BVLOS) are widely regarded by commercial operators as essential if their operations are to make business sense. Further delay on a fix was painful. Being able to identify a remote pilot "is the central concern," the ARC wrote. However, de- spite the pressure for a solution, the authors noted in polite prose that, "the ARC did not reach consensus on an applicability threshold for ID and tracking requirements." ARC Hits Rough Water The panel members presented the FA A with two options for determining which UAS should be required to comply with remote ID and tracking requirements. The members split on which was better but did agree that exceptions should be made for drones exempted by the FAA (for example, military drones) or operat- ing within the air traffic control system. on Remote Drone ID drone integration even more unsure. The Aviation Rule Committee (ARC) on UAS Identification and Tracking (UAS ID) was formed in June 2017 after plans to issue rules allowing drone f lights over people were frozen, suddenly, early that year. The regula- tory plan had stalled after both law enforce- ment and homeland security agencies ex- pressed concerns about allowing such f lights because they had no way to identify bad actors. It's easy to enforce limitations when no one is permitted to make such f lights. When f lights over people become common place, how do you sort out who is f lying illegally and may be dangerous? "While the majority of UAS will be operated new rule apply? UAS ID ARC Final Report Photo courtesy of Commercial Drone Alliance.